The Second Continental Congress resolved to issue paper currency of a "sum not exceeding 2,000,000 Spanish milled dollars. Great Britain's contemptible indifference to the declaration of the First Continental Congress made armed hostilities almost certain. A year later on June 14, 1777, the Second Continental Congress passed a resolution that the Ross flag be adopted as the official flag for the United States. Yet he was the man whom Thomas Jefferson described as "the patriarch of liberty," and whom his cousin, John Adams, described as having "the most thorough Understanding of Liberty" of any of the delegates to the First Continental Congress. Sensible of the growing wealth and power of the young confederation that would become the United States, Spain offered the Continental Congress a very attractive package of trading privileges at its ports in Europe, the Caribbean, and the Philippines, as well as access to Spanish markets for New England's fishing industry. Flag Day honors the adoption of the Stars and Stripes as the national flag by the Second Continental Congress on June 14, 1777. 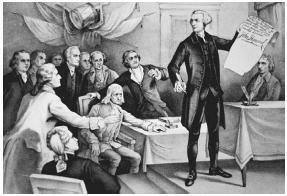 As the First Continental Congress, the delegates call for protection of personal liberties and object to British "taxation without representation. In reaction to the coercive or "intolerable" acts, he and other Massachusetts delegates were able to get the Continental Congress to adopt a nonimportation and nonexportation agreement known as "The Association. In a few years Adams went from a small-town lawyer, best known for successfully defending the Redcoat soldiers accused of killing colonists in a riot organized by his cousin Samuel Adams, to the floor leader of pro-independence legislators at the Continental Congress in Philadelphia. The July 1, 1776, letter was sent to Archibald Bullock, a former member of the Continental Congress from Georgia. As a member of the Continental Congress Jay wrote an Address to the People of Great Britain and composed appeals to Canada, Jamaica, and Ireland to rebel. Gene Mallette, chairman and CEO of Alpine Air, commented, "In 1775, the Continental Congress established a postal service that carried mail throughout the colonies by naming Benjamin Franklin as the first postmaster general.